During installation, you configured Novell Vibe to include an internal SMTP mail host for receiving e-mail postings to folders, as described in Enabling Inbound E-Mail in Basic Installation in theNovell Vibe 3.4 Installation Guide. Your selection during installation carries over into the configuration of your Vibe site. 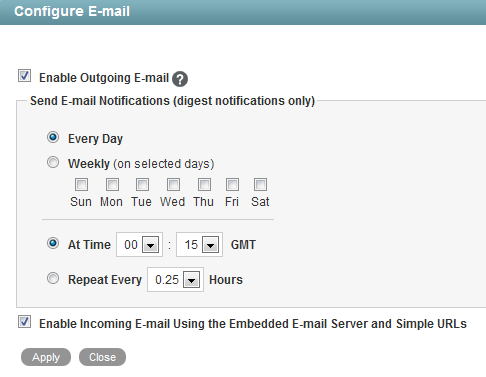 Therefore, you can disable incoming e-mail if necessary, and then enable it again on the Vibe site. Relaying is permanently disabled on the internal SMTP mail host. Select or deselect Enable Incoming E-Mail Using the Embedded E-Mail Server and Simple URLs. Click Apply > Close to save the setting. For information about how to configure folders to receive e-mail postings, see Enabling Folders to Receive Entries through E-Mail in Managing Folders in the Novell Vibe 3.4 Advanced User Guide. Failed e-mail postings are listed in the Tomcat log file. For background information about the Tomcat log file, see Section 28.3.2, Tomcat Log File.